Mayfair Guesthouse is situated just 10 minutes walk from Cardiff city centre. 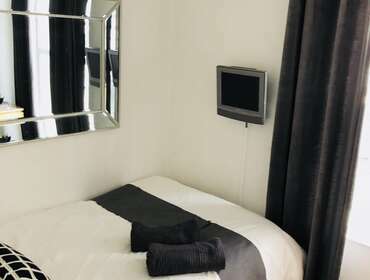 We offer modern, clean and comfortable accommodation in single, double/twin, and family rooms, all of which have flat screen wall mounted televisions with built in Freeview (many channels/radio), and complimentary tea &coffee making facilities. There is a continental or full English breakfast for an extra charge of £5.99 and our rates offer excellent value for money. At the rear of the building we have a large secure car park which is protected with CCTV, and security lighting. Close to the Millennium Stadium, Cardiff Motorpoint Arena (formerly the CIA, Cardiff International Arena), Cardiff Castle, Mermaid Quay, Cardiff Sports Village and White Water Rafting in Cardiff Bay, many of Cardiff's Universities, plus many other attractions.